The Virar local left at 8:02 AM as usual. The ride was usual but today, the end was going to be fascinating. Twenty five-year-old Kalpana Patel had made it to her dream job in the Indian Forest Services. Her long cherished dream of being an IFS officer was about to come true. Kalpana was on her way to Churchgate station to collect the certificates from the UPSC center. ‘Congratulations beta I am proud of you’ texted Jatinbhai Patel her businessman father. Kalpana didn’t respond, her life was not going to be relegated to a Virar-Churchgate fast local, cutting vegetables and assisting her father’s business in South Mumbai. Yet here she was in a Mumbai local train unsure how her future would unfold. As the train moved in slow rhythmic oscillations, Kalpana put on the headphones and drifted away in to the past. She recalled all those nights of research, burning the midnight “coffee”, and writing pages after pages of research and preparing hard for the examinations ahead. Ever since her first visit to the local zoo, she was not only fascinated by the animals but also with the surrounding environment, the rocks, the forest,the trees, the birds –in short the entire habitat.Her dream assignment was to explore the Desert Wildlife Sanctuary in Gujarat. Kutch district in Gujarat had a true saline desert where thousands of flamingos flocked together every year. The Flamingos looked strikingly beautiful. The rich blue colors of the sky and the crystal white saline field added a perfect contrast for the colors to get even more highlighted. By the time winter set in October or early November, the royal blue skies, a pristine white saline field and orange and red Flamingos made for a heady cocktail of colors. It was a sight for sore eyes. 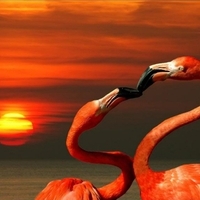 She remembered there was a particular photograph, which showed seven Flamingos in a circle formation. Each had a streak of crimson and scarlet red, a long sensual neck and eyes seemed to suggest, they knew, that they were the most beautiful in the world. Kalpana was fixated with this particular angle where it seemed one of the Flamingos was actually looking at her and trying to say something. As days passed she had become increasingly restless and tried to decipher what could be the hidden message in the photograph? She had a flurry of questions flooding her mind -where was this taken, who took it, why this formation, so and so forth. She was desperate for an answer. It was only after a chance surfing on the net, that she found the name Dholavira. Buried near the flamingo flocks lay an ancient old city, long forgotten yet a key piece of the Harrapan civilization. Dholavira contained the ruins of the Harrapan civilization. The city dated back to 2650 BCE. She knew there had to be some connection with the Flamingos and Dholavira but could not get the missing link. As she intensified her research of the lost city increasingly she found an uncanny connection to her present. The city had three sections, like a pre designed blue print which comprised of a Citadel, middle town and a lower town. It had roughly about sixteen reservoirs and most habitat was based around that. It seemed all the houses were constructed around a citadel. The Harrapans spoke an ancient language which had not yet been deciphered, other than some bits and pieces of artifacts which had some pictures inscribed. Kalpana’s relentless research led her to one such sign board from that era. It had four large images on a big gypsum board. These glyphs had a secret message which no one had figured out until now. She went over the photograph again and again – the symbols were of a wheel, a rectangle shape, a spiral shaped object, and a hollow circle. This image had become a permanent fixture in her head, a puzzle, a riddle she had to solve. As she visualized the image in her head over and over again, it suddenly became clear. For a second Kalpana was in denial – but it was making sense, so much sense that her heart started palpitating,she clenched her fingers as realization dawned upon her. The wheel signified change, or movement, the rectangle shape suggested a box or a container, the spiral shaped object meant there was a path leading somewhere deep, and the hollow circle meant trapped inside. ‘Why would the Dholavira people have this message inscribed?What was the purpose? Were they trying to say something about us or to us?’ she wondered. The sudden jerk of the train snapped her out of stupor and as she opened her eyes she saw that she was the only one in the compartment. ‘That’s odd a Monday morning, and no crowd in the train’ she spoke out loud. As Kalpana became more conscious, she realized her clothes were soaking wet, she was sweating profusely, and breathing heavily. The world was spinning around her, the train was slowing down but the stations zoomed past her, a cold breeze blew across the solitary compartment and from a seemingly hot environment, she was suddenly feeling cold. The train entered its final destination –Churchgate Station and stopped. There wasn’t a single soul, as if they never existed, silence reigned supreme. Kalpana was perplexed and in a state of panic. This was so inexplicable. So bizarre. She just couldn’t comprehend. Her nervous energy made her step out of the train compartment and on to the platform. She began running, then running harder, faster , faster, till she was practically breathless, sightless she ran till the exit of the platform and collapsed just outside the station. As she looked up to the heavens for an answer, she spotted the citadel – it was the Churchgate station,and there was the middle town and the lower town from where she came.This was turning out to be a hidden blueprint of the Dholavira site. Kalpana was trying to make sense of it all, but her brain was too shocked to let sanity prevail. As a last attempt at making sense of it all, she located her mobile phone and hastily dialed her father. ‘Hello Papa – something is wrong with Churchgate station, there is no one around – would you believe that – in fact I - I am the only one – what’s happening Papa, what’s the matter – why don’t you speak. Papa’ she screamed into the receiver. ‘…Mumbai City has disappeared' she ended with a whisper. Seven flamingos perched in a circle watched from a distance remembering how their city had disappeared once…. Gyanban Thoughts -this story has multiple layers, mixing history with the present.There is an element of mysticism,suspense,twist and surreal action incorporated into the narration.The challenge here was having just one character to play,and build the tension.A reference from the past was the connection,and the unreality of Mumbai city disappearing fascinated me. Imagine the shock if you were to witness the absence of the epitome of hustle and bustle. ?The title Flamingo City therefore seemed very apt because they serve as the connect with the past - and also act as an omen to the future. Dholavira is a real site discovered only in the late 60's by Mr.J.P.Doshi and is the fifth largest Harrapan site in the Indian subcontinent.It is located in the Rann of Kutch and is visited by flocks of Flamingos every year whose origin is unknown. The source of information :Archeology. Thanks for reading Apala and welcome to Gyanban. Welcome and thank you Mr.Suresh. What a gripping story, I wish It hadn't ended. I was very interested in knowing what kalpana does to get out of this strange city. You've done a brilliant job with the descriptions, could imagine every bit of her terror, the city itself. Do write a sequel to this sometime! Yes,that is a good suggestion Anjali - will keep in mind.Thanks for reading and welcome to Gyanban. I have often thought of Mumbai minus the hustle and bustle and the thought itself is scary.Captivating story.Best wishes for the contest! You will be glad to know that after thumping success of hamarivani.com, which is a unique rendezvous of Hindi bloggers and readers spread all over world, we are feeling jubilant to introduce Bloggiri.com. At Bloggiri, your blog will get a huge horizon of new readers to share thoughts and ideas with you, because your blog is just reflection of your soul and inner beautiful. Now what are you thinking, just submit your blog at Bloggiri.com and give a new meaning to your life. It was great meeting you at the Indiblogger meet on Saturday! Just a couple of queries, if the whole city has disappeared how does the train still reach CHurchgate. If there was a tsunami, a nuclear attack or some calamity wouldn't the train also have blown-up / been destroyed with the rest of the city? I understand the analogy of the seven flamingoes - a bit like the Albatross - 'In the Rime of the Ancien Mariner'. Mahesh - Thank you for reading. The storyline suggests that the people in the city had disappeared which was akin to the city disappearing itself.You probably read the last few lines for this conclusion.My request is to read the whole story again to get the subtleties. On how it disappeared is left to the readers imagination - there is no mention of a Tsunami or nuclear war as such and that is by design. The seven flamingos are not like the Albatross - if you read the history of the region Kutch - you will find the relevance to the Flamingos. I read up a bit on Dholavira and now on re-reading your story there is a bit of enlightenment :) I realize that it is not like the Albatross!